Sacred Shapes – Can they Heal? What is a Light Language Grid? Tantra Talk – Watch the Video! 2013 Negativity – Notes of Releasing Mind Chatter Talk – See the Slides! Having trouble paying due to ‘phone not from here’ etc? Then please email jelila@jelila.com to confirm you are serious about attending your appointment. If planetary destruction is being caused by us – then the change must happen in the same place – within us. Jelila explains how – and while you’re doing this important Planetary Healing Process – Jelila also explains why things have always been this way – what really causes our ‘stress’ as humans – hidden, secret planetary history, that you need to know, right now. And how to change it. Please use the link below to share this information, which also has powerful and wonderful benefits for your life – as explained in the videos. ‘A real life healer’ – your Best Spiritual Teacher in Ubud Bali & Online: Booking: Call +62 8585 735 4228 mobile to Book. Quiz: How Advanced are You, Spiritually? Are You a Master Manifestor? Or could your Dream-Making Mojo Use a Boost? Find out in my revealing Free Quiz! Want to balance every area of life for happiness and contentment through a powerful yet simple process? Watch my Video & Find Out How! Dolphin Journey - Atlantis - Click to Listen and Fly! Want positive Sacred Geometry energy in your Aura? Is Your Aura in a Good State? Light Language – What is It? Sacred Shapes – How Can They Heal? Need a way to unwind? Can Crystals Heal and Help You Feel Good? Which Crystals are Good to Wear Every Day? And Which are Best for You? Click to Find Out. Feel Bad? Click to Cheer Up..! Past-Lives? Who Were You? Want to Explore your Past Lives? Gently release past-life patterns or trauma in a simple process anyone can do, with Jelila. Click here. Can the Yoga Chord Healing Crystals Harmonise & Heal You during Yoga, Meditation, or Every day? Watch my Video to Find Out. How can simply Listening to this Healing Love Music Improve Your Love Relationships? Stuck? Need to access your inner Visionary? Do You Love Sacred Geometry & Want to Know More? Click Here. Confused? Need help with Clarity on a Decision? Need a little spark to get fired up creatively? Do Crystals have the Power to Heal & Harmonise? Click Here to Find Out. The Gift of Harmony – How to Get off the work treadmill and enjoy work – life balance. Shamanic Healing Journeys – Does this Music Make YOU Feel Good? Guided Meditation Journey CDs – Do they help you Relax? Crystal Healing Necklaces – How does the Positive Vibration of Specially Programmed Crystals make YOU Feel? Is Your Aura in a Good State? Are Your Chakras Blocked? What Sacred Geometric Shapes and Colours do You Have in Your Aura – and What Do They Mean? Free Download Jelila PDF MP3 JPEG etc – Great Free Stuff! Need Nspiration? Magic Book. Click Merlin to Find Out. Interested in Sacred Shape Geometry? Jelila is a top international holistic coach who blossoms hearts desires! Can Grids of Sacred Shapes and Colours Heal and Manifest? Click to Find Out. Your Inner Child – Joyful? Or Hurt and Hiding In The Cupboard? Release Your Stuck Throat Chakra. Self-Healing Tips and Tricks – Easy yet Powerful Ways to Feel Good – For your Happy Life! 4 New Crystal Healing Necklaces By Jelila – Power Up Your Positive Energy With Crystals! New! Get a FREE MP3 TOO! Video: Neanderthals – who we are? An affectionate Video portrait, by Jelila. Click above. Neanderthals – was their DNA manipulated and betrayed to make us? Is the reason why we have a different voice – the ego inside of us – because we are made from two different kinds of beings? What feelings and patterns might we carrying from these ancient events? And what can we do about them now? Find out in Alien Wedding – Ancient Alien Healing. How would YOU feel about the theft of your DNA? In this book, Jelila has managed to identify a powerful set of negative old ‘slave drivers’ – subconcious beliefs that keep us stuck in old patterns of trying to please others – suffering and lack, really – slavery.I had not heard the story until now. A fascinating and powerful book with a powerful process built in – I really enjoyed releasing negativity and feeling the positive results of relieving stress. A great book! Its such a unique and incredible book that helps us discover why we are so set on working all the time and where this comes from. Its not what you think. Written with a fabulous sense of humor and with some really great imaagery. Very impressed. BOOK EXCERPT © Jelila 2013. All Rights Reserved. In ALIEN WEDDING, Jelila briefly tells a story of what may have actually happened at the very beginning of the creation of humanity – an ancient betrayal creating a 14 hidden ‘Key Stress Drivers’ or ‘Key Slave Drivers’ that she describes in her book step-by-step – and shares a simple process that everyone can do to release these hidden stressors – greatly relieving stress – and bringing inner peace and harmony.Here’s an excerpt – followed by one of the 14 Key Stress Drivers. Alien Wedding – Our Ancient Intimate Betrayal? Far from the romantic, radiant, white clad bride in a lovely lacy dress, elegant gloved hands flinging her pretty bouquet to the excited bridesmaid recipients, waiting to be next… marriage has some dark early history! In fact, mankind’s first marriage – was an Alien Wedding! This story has been described by Erich von Daniken in Chariot of the Gods in 1970 and by Zechariah Sitchen in his books. I’m going to outline the story here – but what is important and unique about my book is that I am going to explain the emotional impact of what happened – and what to do about it. Early mankind was created by genetic manipulation, by advanced beings – extra-terrestrials – who came to earth. Why they created us – and what then happened – means that humanity is bearing some very heavy baggage from an early escapade in our history that we have not, until now, been aware of – actually the earliest and deepest possible kind of betrayal you can imagine! Effectively, they abused us by messing around with our DNA. The deep, yet unconscious sense of betrayal and disappointment we are sub-consciously carrying from this event, creates uneasiness and lack of trust in our experience of governments, bosses, authority, and mistrust and disappointment pervades and wrecks our relationships now. Accessing and releasing this deep betrayal and mistrust at last allows us to feel safe, to relax, it releases a huge amount of stress, and it allows us to relax and trust in relationships. Why Are So Many People Stressed? Humanity is stressed because everybody is working too hard. Why is everybody working too hard? Because everybody feels that they have to, to have enough. But why? Why do people do what they do? Why do normal people choose to willingly harm themselves? For example, why do people smoke when they know it causes cancer? Drink when it harms their health? Why? W hy do people kill themselves? Over-eat or under-eat? Or Self-Harm. Why? Why don’t people care – about themselves? What is this intrinsically self-destructive pattern in mankind? How did it get there? And is there anything we can do to change it? Have you ever wondered what is it that is constantly driving you to work so hard to prove yourself? Why is life ‘a grind’? Where do your negative thoughts come from? Why does it sometimes seem like an argument or conflict is going on in your head? Why are you unsure of what direction to take, of ‘what you are supposed to be doing here’? Why is there a ‘war between the sexes’? Why can’t you always get the love you need? Why are love relationships so difficult? Why do you feel low self-esteem? What is the root cause of discomfort that makes you feel undeserving, and makes it so hard to ask for what you want and need in relationships? Why do negative experiences sometimes show up in your life that you don’t want, which are difficult for you to deal with? Is it ‘your fault’? Is it ‘bad luck’? Or is there something you can do about it? Are the causes of negative, unhelpful patterns or behaviour mysterious or totally invisible to you and completely out of your control? Would you like to know what they are and get them under your control? How can you create what you really want in your life, without all the hassle? What Set Up Your Ancient Stress Patterns? What if you discovered that ancient thought patterns or sub-conscious beliefs – Ideas such as ‘I am not lovable’ or ‘I can never be rich’ and some other, even more powerful ideas – which are negative, incorrect – out of date – or even totally intrinsically wrong – are hidden in your system – and controlling your life? And what if you suddenly discovered that you can gain access to such limiting, underpinning layers of negative thought established by ancient ancestors, which you are logically unaware of yet which sub-consciously driving your mind and life today – and change them? Effect: The Grind, The Treadmill – trying to escape it. Exhaustion. Story: The Annunaki were trying to escape work – gold mining – by getting us to do it for them! So this feeling has been transferred to us – we are all looking for Holiday getaways, Weekends in the country, a Day Off – we are all trying to escape – escape from working – escape – from being Slaves – for the Annunaki! Belief: I’m trying to escape work. Only, if you do finally escape from being a Slave, then you have to live with being a fugitive – be outside of society, not following normal ‘rules’. It takes presence of mind to do that. That would be the ‘trying’ aspect of escaping work – a trying experience. Note that trying is not succeeding – it is working towards a goal but never actually getting there! So trying to escape work results in not escaping work – and having a trying time. Because ‘work’ is physical, at the deeper level, it represents your physical body. So, we are also wishing to get out of our bodies, escape – stop ourselves from re-incarnating into this horrible, treadmill-esque world of never having enough, always working – for the Annunaki! To the sub-conscious mind ‘work’ is synonymous with ‘money’ – the sub-conscious mind just lumps all physical things together and thinks of them as one thing. So if you are ‘trying to escape work’ your sub-conscious mind will think you also wish to ‘escape money’, which could end up pushing your money away from you. New Positive Idea: I’m loving my existence here. I’m provided for. I have been fascinated by the ancient aliens theory of the origins of human civilization for many years, having spent much time with the work of Erich von Daniken and Zecharia Sitchin. Depth psychology has also been a passion of mine for a long time, as I have attempted to understand my own patterns and reactions throughout my life. Alien Wedding amazingly combines these two pursuits, in a way that I never would have expected a book to do so. I would recommend this remarkable book to anyone who wants a more clarified understanding of their own negative tendencies, with a fascinating approach to how they have developed in us as a species, and as individuals. Alien Wedding is an exceptional book, a wild ride, and an uplifting tool. 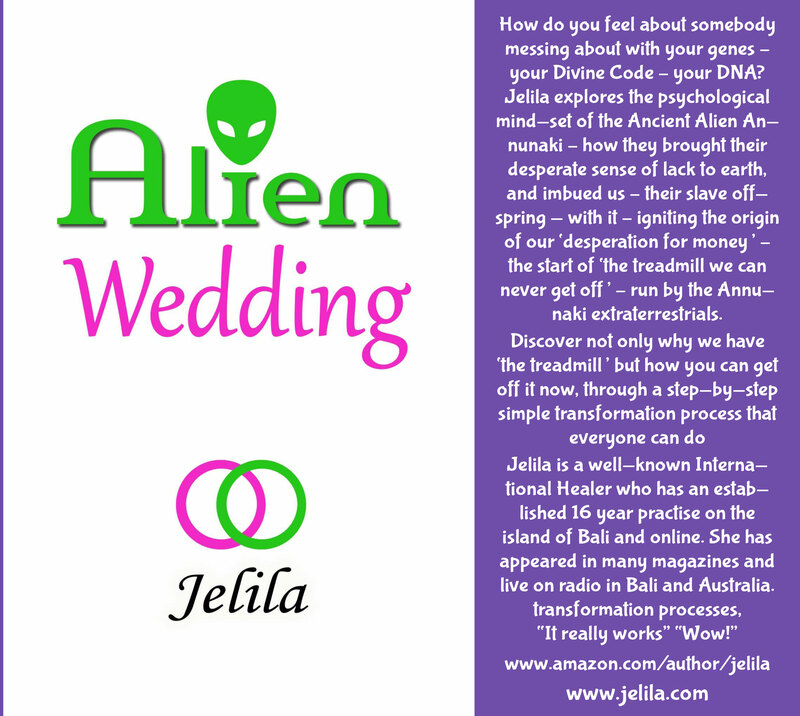 Reserve your spot on the Alien Wedding Personal Transformation Course with Jelila and Find Out More. Alien Wedding – Book – by Jelila – Ancient Egypt, Sumeria, Atlantis, Annunaki, & Now – How an ancient betrayal of your DNA is underlying the stress you feel now – and what to do about it. Is our ancient DNA Betrayal the cause of our present Self-Esteem issues? And what can be done about it? Alien Wedding is a powerful and deep book by Jelila that guides you to discover, step-by-step, the hidden emotional and stress impact of the Ancient Alien story. Has an ancient betrayal around genetically engineered humans left its mark on us? They did not look like this. They looked – like us! It may sound far-fetched – but once you hear the story and let it sink in, and when you feel the effect of the transformation process in the book, you may be surprised to find it resonates with you! Thousands of years ago, advanced beings – the Annunaki – came to earth to mine gold to fix their dwindling atmosphere – and created a slave race to mine the gold for them, using their own DNA and the DNA of the original Neanderthals. This race was called ‘hu-mans’ – hu means ‘god’ and ‘man’ – the Neanderthals. But it was not the real God – it means the ‘gods who came from the sky’ – the Annunaki. As a result of what was really a deep manipulation and betrayal – messing with our DNA – I believe that we – humanity – picked up the drivers of the stress that all humans commonly feel now. Discover what really causes your stress – hidden ‘Key Slave Drivers’ and how to release them – and release your stress to feel happy and free – in Alien Wedding by Jelila. Also: As well as being a book, Alien Wedding is also a personally guided deep transformation process. US$ 1,100 it takes a week to complete. ( hu-man = god + man – although the Annunaki weren’t really ‘God’ they were just thought of as ‘gods’ by the primitive humans – as they appeared out of the sky in spaceships in a way that had never been seen before). Image, Left: The Annunaki in a 6,000 year old Cuneiform tablet from Sumeria. 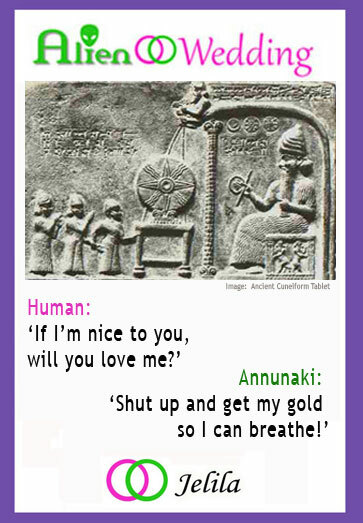 In her book, Jelila works through the story of the Annunaki step-by-step, describing the negativity that is hidden deep in your system due to this ancient story of betrayal and mistrust – and gives you a process in full to allow you to release the ‘Key Stress Drivers’ – or ‘Slave Drivers’ within that keep you on the ‘treadmill’ – so that you can get off it. I have been fascinated by the ancient aliens theory of the origins of human civilization for many years, having spent much time with the work of Erich von Daniken and Zecharia Sitchin. Depth psychology has also been a passion of mine for a long time, as I have attempted to understand my own patterns and reactions throughout my life. Alien Wedding amazingly combines these two pursuits, in a way that I never would have expected a book to do so. Jelila provides us with an explanation for the initial reasons for much of our stresses and negativity, however she also, incredibly, offers many different practical methods and techniques with which to work to dissolve these patterns, or “Key Stress Drivers.” I would recommend this remarkable book to anyone who wants a more clarified understanding of their own negative tendencies, with a fascinating approach to how they have developed in us as a species, and as individuals. Alien Wedding is an exceptional book, a wild ride, and an uplifting tool. To book on the Alien Wedding Personal Transformation Process with Jelila please click link above. Filed under: ALIEN WEDDING, MESSAGES | Tagged: 2013, 2014, 2015, Adam and Eve, Alien Wedding, Analysis, Ancient Alien Theory, Ancient Aliens, Angels, Annunaki, Anunnaki, Chariot of the Gods, Clay Tablets, Conspiracy Theory, Creation Myth, Creation Story, Cuneiform, Deep Psychology, Divine Code, DNA Manipulation, Enki, Enlil, Erich von Daniken, extraterrestriala, extraterrestrials, Garden of Eden, Mesopotamia, Michael Tellinger, Nibiru, Phaeton a reckless quest, Secret History of the World, Slave Drivers, Slave Species of the Gods, Spaceships, Stress-Reduction, Sumeria, The Bible, The Conspiracy theory is correct, The Flood, The Gift of Harmony, The Reprogramming Jelila Ubud Bali, This is Bliss, This is not good, Transformation Book, Transformation Course, Transformation Process, Treadmill, Twelfth Planet, UFOs, Zecharia Sitchen |	Comments Off on Alien Wedding – Book – by Jelila – Ancient Egypt, Sumeria, Atlantis, Annunaki, & Now – How an ancient betrayal of your DNA is underlying the stress you feel now – and what to do about it. Become a Member and receive Spiritual Insider Info. Strict no spam. Online Clients please Click Here for Online Sessions and to Book and Pay Online. SOULMATE LOVE READING: Discover Love in your Aura, find your Soulmate. A General Reading is also available – you will have the chance to select Soulmate Love or General as you order online. CHAKRA BALANCING / INTUITIVE HEALING / SOUND HEALING / CRYSTAL HEALING / LIGHT LANGUAGE HEALING / REIKI / PSYCHIC HEALING / ENERGY WORK, ETC. REVOLUTIONISE YOUR LIFE in 2.5 – 4 Days! Discover how CRYSTALS can help your sense of WELLBEING every day! As you wear my specially programmed Crystal Healing necklaces, you pick up the positive vibrations – and feel good! Very popular with my clients, Guaranteed for 10 years against breakage, easy to cleanse – you just need to blow on them to relieve absorbed negativity. 12 in the range to collect. Online sessions are available . Spiritual Pathfinder? Click to Find Out. Which of 3 Kinds of Spiritual Pathfinder Are You? Highly Recommended on Trip Advisor: Jelila, 5*****. ‘Safe, Trusted and Wise’ ‘Amazing’ ‘My Ketut Liyer’ ‘A Real Healer’. a well-known International Healer who Blossoms Hearts Desires through a range of life-enriching healing sessions including Crystal Healing, Energy Work, Past-Life Journeys, Sound Healing, The Reprogramming™ her Signature Technique, The Gift… of Harmony™, her own range of Crystal Healing Necklaces, Healing Music, Books, and more. She has appeared in many magazines and in Asia and Bali at top resorts like The Four Seasons, The Bale, and The Westin, and has a wealth of experience and depth to help you – for living in delight! ‘I understand so much more about love now!’ ‘You helped my relationship so much! Article – Chakras – Are Yours Blocked? Do You Have Good Energy? Sacred Shapes - How Can They Heal? Click Here. Get Started Now – Join Free! Join Today - Get Spiritual Mastery Updates, and Instant Access to my 11 Minute Free Training Video, Releasing Negativity and making your Life Easier and More Fun! How do people respond about Healing Sessions with Jelila? Click to Find Out. Did You Know that Specially Programmed Crystals Can Absorb Your Negativity Completely Naturally, Leaving you Feeling Cleansed? Want to balance your life? Get off the Treadmill once and for all? The Gift of Harmony Book and Transformation Process by Jelila. Click to watch Video and Start the Process of Balancing your Life. Are You a Spiritual Warrior? How do you like to blossom? Click to Find Out. Are Yours Blocked? Click to Find Out. Full Colour PDF Detailed Healing Menu (6mb) Please Click for instant Free Download. Join for Enlightening Offers & Updates! SUBSCRIBE FREE for Enlightening updates and offers! How can crystals make you rich? Can the Abundance Crystal Healing Necklace help expand your Wealth? Want to Reprogram Negativity so you can Consistently Feel Good? Money Back if not Completely Satisfied. Click to Find Out. JOIN NOW – for Discounts, Tips, and More! What shapes are the Chakras? What Chakra Shapes do you have? Click to Find Out. Want to Blossom by Releasing Your Negativity Permanently? Signature Session Packages with Jelila let you release negativity permanently - Blossoming Hearts Desires! Click to see Video and Find Out More. Usually its not this bad. Though sometimes, it is. Feeling Stressed or Got a Big Problem? I'm currently seeking committed Clients who want to work through Big Stuff over weeks or months as this is where I can really help and add most value. Click to Find Out More. Absolutely! Yup! How shall we make your blossoming happen? :) Click to Find Out. Want Gentle Harmony with Sound, Crystals, Enerlgy? Want to draw Metatron's Cube with my Free Template? Click Here! Do Butteflies Inspire You? Want some inspiring Butterfly Quotes and Images? Want Metatron's Cube? Pinky-Purple, White or Black? Which Sacred Shapes are Good for You? Want to buy Metatron's Cube? Blossoming your heart's desires often includes helping you find your MOJO - what is uniquely yours to express. What's Your Mojo? What Does Colour Mean to You? What Colours Are In Your Aura? Click to Find Out. What's your spiritual style for blossoming your heart's desires? Click to find out. Is your Sacred Geometry supporting your Goals? Sacred Geometry Flower of Life Earrings for Harmony? $19. Click to Buy. Sacred Geometry – Wanna Know More? What's the Sacred Geometry in Your Aura? And What's Light Language? And What's a Light Language Grid? Watch my Fascinating Vid and Find Out! Can Crystals help you Communicate? Why Not Visit My Art? What is the meaning of Metatron's Cube? Click to Find Out.